I’m anxious. It’s just before sunup on the seventeenth day of our passage and in the darkness ahead is an island. Unlike all the previous nights there is now something hard out there to wreck the boat upon. I’ve carefully plotted the course and verified it with the GPS but until I actually see the island I won’t relax and won't be convinced that we will indeed pass to the east of it. The island is Anguilla and I need to pass by it to reach our destination, St. Martin, just to the south. Anxiety dominates my spirit and makes it impossible to relish the final moments of what has been, at times, a difficult passage. We started out from the marina at Ft. Monroe, Virginia and our week there was quite pleasant. Among other things we decided to drop in on the United States Continental Army Band and visit with their commander, Major Timothy Holtan, who was, a few years previous, an officer at the Army Band in Washington where Linda and I worked. Major Holtan was justifiably proud of his band at Ft. Monroe. We were quite impressed with the quality of individual musicianship and the ensemble playing on the day we attended one of their rehearsals. One of the nice things about being retired Army is that we can avail ourselves of the services offered to military personnel. At Ft. Monroe I went to the post Library each day to access the Internet and download weather maps. The maps were telling me that a stationary high-pressure system was developing between the east coast and Bermuda, a "Bermuda High." The upper level winds had moved north giving us a chance of starting a passage without the possibility of being run down by one frontal system after another. It was time to go so we set out on the morning of the sixth of May. 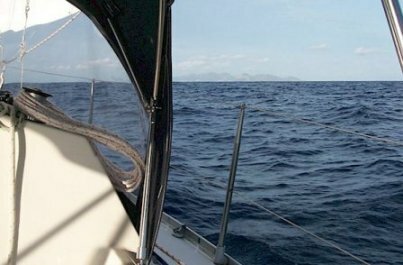 A feature of modern passage making is weather routing, which is the practice of making daily adjustments to the yacht's track in order to make the best use of the existing weather systems. Normally a yacht would subscribe to service that would give daily routing advice through the radio. This is expensive and certainly outside of our budget but in the North Atlantic yachtsmen have Herb Hilgenberg who offers the service for free. Herb is quite a remarkable person. His expertise on North Atlantic weather is second to none and his advice is extremely valuable to anyone making a passage. His dedication is outside anything expected from someone doing this as a hobby. He maintains a radio net for three to four hours every afternoon for seven days a week. We joined the net on the first day out and were immediately redirected to avoid "sailing into a hole." Herb bluntly told us that if we continued our track we would sail into an area of no wind and told us to head directly for Bermuda until we were beyond this area. Knowingly sailing into a Bermuda High such as we were doing meant that we should expect quite a lot of light going but where Herb directed us had plenty of wind and from the southwest which was ideal. There was a stalled front to the north, which caused the isobars to "compress" or move closer together. When a pressure change occurs over a shorter distance the wind is amplified. We were able to cover quite a lot of distance on the first six days of the passage. There were times when the wind was too much. On the evening we crossed the Gulf Stream we had as much as thirty knots of wind and more requiring us to double reef the main sail and reef the genoa. In spite of the shortened sail it was still quite a toboggan ride. Passage making requires something of a dramatic change in lifestyle. From a life with a rich variety of activities you’re reduced to the confines of a small yacht upon the emptiness of the ocean. Managing the progress of the yacht takes overwhelming precedence. We have to "stand watches," which means one of us has to be in the cockpit and in control at all times. With only two of us standing watches twenty-four hours a day we had to accept a significantly altered sleep schedule. Overnight we stood three-hour watches, which meant that during the entire passage neither of us received a full night of uninterrupted sleep. We have autopilots and we don’t have to hand steer the boat so when the wind is steady and strong standing a watch is, many times, nothing more than "babysitting a boat." The sails are set and the wind vane is steering so there is nothing more to do than sit in the cockpit and watch for ships which may cross our track. Staying awake becomes the greatest challenge. On the fifth day out Herb gave us the word that we could shape a more southerly course. It felt good to follow a track closer to our actual destination but with the course change came a lightening of the wind. We were to learn that the second half of the passage would be more challenging than the first because of the scarcity of wind. 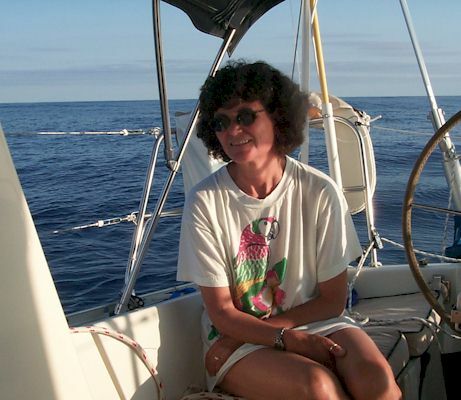 It’s quite an experience to be becalmed in the middle of the ocean. The water takes on an oily sheen. There is no wind. Common sense tells you that the wind will return but your emotions can take over and say to you that you’re hundreds of miles from land with no way to propel yourself. Visions of an albatross tied to my neck played in my mind. The challenge became to keep my head straight. The wind came back but fitfully making it necessary to work hard to take every advantage to make progress. Convectional weather builds up creating squalls meaning that, amongst the light air sailing, there are periods of heavy going. Once again we had to double reef the main sail during a particularly strong squall. No longer are we just babysitting the boat. Watches are punctuated by sail drill to match the sail configuration with the changing conditions. Much of the drill requires the two of us meaning that the off-watch person loses sleep. Sleep deprivation becomes more intense. Our goal was to push through the light winds and find the easterly trade winds but each day as we talked to Herb an upper level trough had pushed the trade winds further south. We’ve been making progress but someone was moving the goal. Days of working to gain every inch and sometimes feeling that our efforts were futile eventually resulted in belatedly finding the trade winds. It was only a day away from St. Martin but we finally found them and when the sun finally rose on the seventeenth day Anguilla was right where it was supposed to be and my anxiety began to dissolve. The passage was coming to an end and we would finally be able to return to a more stimulating lifestyle and, most importantly, get a full night of uninterrupted sleep. The passage from Virginia to St. Martin took seventeen days and one hour and covered 1,652 nautical miles. It was an adventure but we’re glad that it is behind us. The first passage is complete. We were now looking forward to Island hopping in the Caribbean. We’ll tell you all about it.